Since with the addition of the "retirement ranch" we simply cannot maintain three properties, so we have finally made the difficult decision to consolidate farms. Therefore ALL the animals need to move to one property. (Eeegaads!) This simply isn't possible, so we must let go of some sheep and cattle. And even though we've already cut down numbers for the drought, we have to be realistic and cut down some more. This translates to a lot of leaning over the fence, assessing who stays and who goes. We cuss and discuss temperament, productivity and the importance of being objective.
. . . I'm not very good at being objective. 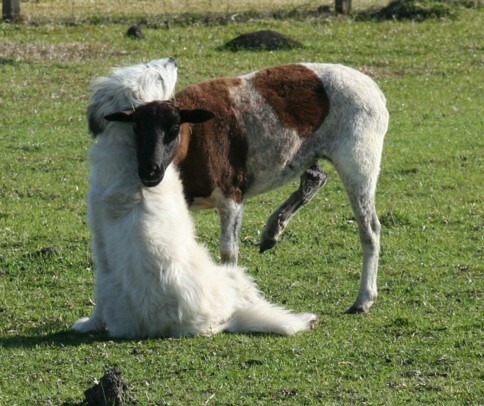 I just can't seem to bring myself to sell this ewe. She doesn't keep weight as well as the others, and her babies aren't any bigger than the other babies. Most of the other sheep are just sheep, but this ewe is different. And so . . .
. . . is her dog. But then . . . since a sheep alone is an unhappy creature, I need to select one or two "friends" to come with her. Do you see how this plays out? One extra sheep becomes two or three. But Other Half has no leg to stand on, no room to gripe about my inability to be objective - for he has Killer. Killer is a cockatiel. Year ago he found Killer wandering along the railroad tracks. Other Half picked him up and Killer promptly bit the sh*t out of him. Killer has been a Prisoner Of War since then. He sits in a cage in the living room, watching television, and staring out the window, dreaming of days when he was free - free to search for his own food, free to freeze to death, free to be eaten by hawks, but free nevertheless. Killer does not wish to make friends with his captors. There is no Stockholm Syndrome at work here. His best friend is his reflection in the mirror. His image is as grumpy as he is, but it doesn't eat his food, so he's okay with it. I begged Other Half to find a proper bird home for Killer. He reluctantly agreed, but then, at the 11th hour, he backed out. "I wanna keep Killer" he said. And that's when I knew . . .
. . . 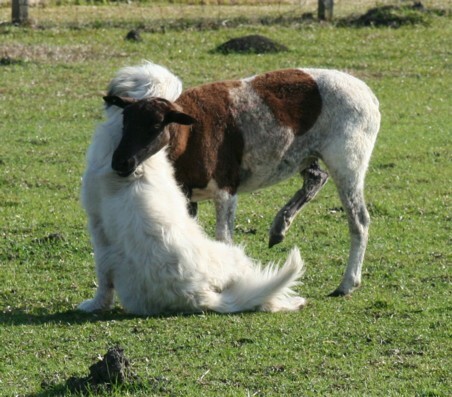 I knew there would be no discussion over why I was keeping this lame ewe. I don't know whether to tell you to STOP posting those photos of Briar and Roanie or to thank you each time! I always get teary-eyed when I see them. It never gets old! :) Do they still behave like this with each other still, or was that a one-time thing? BTW - It's raining in Katy right now! Me too! (That's why I just can't sell Roanie!) Yes, they are still friends. 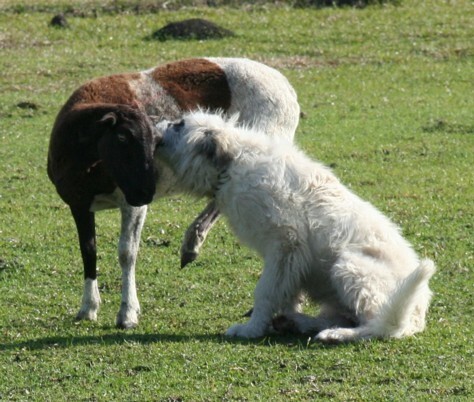 Briar is much bigger now and has sheep on both sides of the property, so she bounces between the two areas, but whenever she's in the pasture with the ewes, I note that she and Roanie still appear to be fond of each other. I still find that fascinating. Ask Lily which sheep to keep! I still can't believe you added the goats knowing you would have to cut way down on sheep, but then you get great milk to drink in exchange. The sheep and goats have such different pasture requirements that it wasn't much of an issue. The dairy goats don't require much space at all and eat browse that the sheep don't eat. The other property is better suited to goats than sheep but I'll still keep some sheep. We'll just have to cut the numbers down. Does otherhalf ever read these pages. "Just askin" You are giving away yr secret women's skills as how to manage things.................Is mum staying? don't suppose redmon is hanging around cuz of killer, is he? glad you can keep Roanie and a few of her buddies - and of course, none of the dogs will be rehomed, will they? always enjoy your pics and stories - so different from my suburban New England world. Re-home dogs!!!! Oh HECK NO!!! Dogs are furry children! (Even Briar) Some of the sheep will go with Dear Friend, some will stay with me, and the rest will go to a ranch near our new ranch, so all the sheep are gonna be fine. Killer is at the other house. I imagine he would freak if he saw Redmon pecking at the window!